The Library uses MODS as its primary descriptive metadata schema for collections and items within the Dartmouth Digital Library Program. Depending on the digital project, new metadata may be created within MODS, or transformed programmatically from existing data sources. 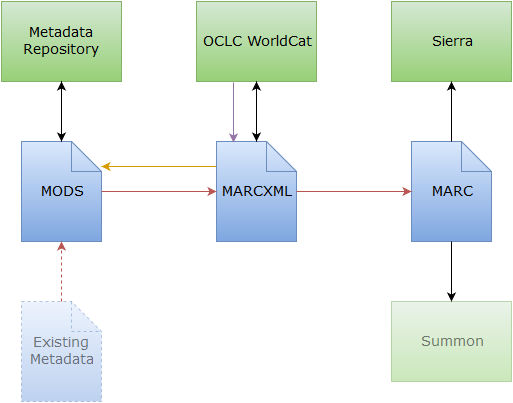 A partial workflow diagram illustrating the path between MODS metadata and WorldCat for digital library metadata. In recent months, we have begun using the WorldCat Metadata API to efficiently contribute batches of new or updated metadata for our digital assets to OCLC's union catalog. 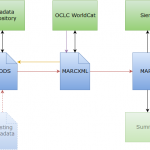 Following a metadata transformation from MODS into MARCXML on our end, the API enables us to directly create or update WorldCat master records. The API returns OCLC numbers and other administrative metadata that is stored in our local metadata repository to support iterative record enhancement across both systems. To incorporate the API into our processes, we developed a new Ruby-based command-line tool, dcl_wc_metadata_api, for which source code and documentation is available on GitHub. Terry Reese's wc_metadata_api and OCLC's oclc-auth-ruby code libraries were critical to this work. 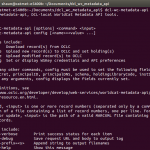 The help text for the dcl_wc_metadata_api command-line tool. I had the opportunity to share further information about the API and our workflow and tool development at the ALA Midwinter Meeting in January, as part of the ALCTS Technical Services Workflow Efficiency Interest Group program. My slides are available online: "From MODS to OCLC through the WorldCat Metadata API". 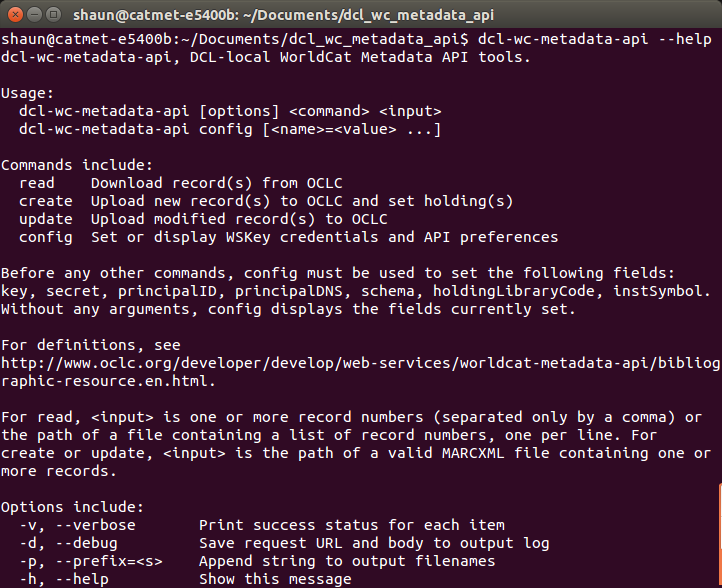 I'd be very interested to hear from anyone currently using the WorldCat Metadata API and/or anyone who may have similar use cases for a command-line tool such as this. Additional improvements to dcl_wc_metadata_api are forthcoming, including to leverage recent enhancements to the API itself. To follow its development, stay tuned to future releases on GitHub. NISO virtual conferences and webinars will be streamed live this year whenever possible. Archived recordings will be added to the Library's Webinars List wiki page. The schedule of events is listed below. Detailed agendas can be found on the NISO website. Please contact Shaun Akhtar with any questions. All virtual conference screenings take place in the Baker 11 conference room on Wednesdays between 11 a.m. and 5 p.m.
Training Thursdays take place between 1 and 2:30 p.m.
All webinar screenings take place in the Baker 152 conference room on Wednesdays between 1 and 2:30 p.m.
March 16: Part 1: What Data is Being Collected and By Whom? December 14: Make it at the Library: How Does Technology Support Makerspaces? Nien Lin Xie, in collaboration with Julie Wang from Binghamton University and Ding Ye from Georgetown University, recently completed a scholarly monograph, "Ding Jiali dang an = The Papers of Charles Daniel Tenney" which was published by Guangxi Normal University Press in February, 2015. The book includes a translation, from English to Chinese, of the papers held in Rauner Special Collections Library. The translation opens the content of these papers to Chinese scholars. The book also includes an introduction by Professor Pamela Crossley, detailed biographical information about Mr. Tenney, a chronology of his life and works, and a description of the process that led to the creation of the book. Also included is a transcript of Mr. Tenney's 1907 speech to Dartmouth students about the value of education, which originally appeared in the Dartmouth Bi-Monthly, a predecessor of today's Dartmouth Alumni Magazine. The Dartmouth Digital Library Program digitized and transcribed the papers, and made them available to scholars. In addition to the images of the original papers, displayed alongside the transcribed texts, this presentation includes the Chinese translations of the texts, the introduction to the monograph, the chronology, and the 1907 speech. Who was Charles Tenney and why was his work so important? This essay answers these questions and provides context for the papers. Charles Tenney, Class of 1878, never imagined that he would return to his alma mater in the "character of a Chinese official." Tenney returned to Dartmouth on March 2, 1907 as the director of Chinese government students. He had trained over fifty percent of the more than one hundred Chinese students who had enrolled in graduate programs at Ivy League institutions and MIT between 1901 and 1907. In fact, his students achieved such a high level of education that they entered these programs without having to take entrance examinations. Many notable alumni from his university eventually took leading positions in various fields in China and played important roles in modern Chinese history. Tenney went to China as a missionary in 1882 but left the Missionary Society in 1885. He believed that his duty lay in the field of education. He went to Tianjin where he opened his own independent school of Western learning for Chinese boys and young men. His success drew the attention of Viceroy Li Hongzhang, the highest and the most important official in China at the time, and he soon became the tutor of Li's children. With the support of the government and the approval of Emperor Guangxu, Tenney established Beiyang University, the first Western-style university in China, in 1895. He remained president of the university for eleven years. Tenney was a pioneer of Chinese educational reform. Traditional Chinese education focused on ethical teaching, which Tenney considered to be narrow in scope. At his university, he mapped out the curriculum, employed top teachers from both the West and from China, and recruited excellent students. The university offered courses in English, math, sciences, civil engineering, electrical engineering, mechanical engineering, mining, law and other subjects. Through this work, he set the direction for a new school system to develop. His role in modernizing education in China was unparalleled among Westerners during his time. Tenney's efforts were hugely successful because they met the urgent need to solve a national crisis experienced by the Chinese. In 1895, China was shocked and shattered at its humiliating defeat by the tiny island country Japan. The Chinese were compelled to rethink their existing system, and to embark on a program of reform and modernization by learning from Westerners. Determined to bring China into greater interaction with the larger world, Tenney worked tirelessly, sometimes under extremely difficult conditions. There were times when his students and teachers had to be armed and stand guard day and night to prevent attacks from "reactionaries" who opposed the reform movement. During the Boxer Uprising in 1900, his university was forced to suspend class activities for two years. The campus was damaged and occupied by German troops who used it for barracks. In order to rebuild the school after the uprising, Tenney went to Germany to negotiate damage claims with the German government. He was successfully granted 50,000 silver yuan by the German government. Tenney didn't stop at reforms for higher education. He understood that reform needed to penetrate beyond the university if it were to take root in the larger society. In his own words, he "had the privilege of assisting in the organizing of lower schools throughout the interior of the Metropolitan Province. A modern school system is now completely organized throughout China. It is not yet highly efficient owing to the lack of a sufficient number of well-trained teachers, but every year and every month will see progress in real efficiency." To acknowledge Tenney’s service to China spanning over thirty years, the Qing court awarded him with Double Dragon, 3rd class medals and 2nd Order of Merit. In 1901, Dartmouth awarded him an honorary Doctorate in Law. Clearly, Tenney, while largely forgotten today, was one of Dartmouth’s most distinguished graduates during his time. See The Papers of Charles Daniel Tenney, available through the Dartmouth Digital Library Program. We will be screening a large set of NISO webinars and virtual conferences this year for Library and other interested College staff. If there are any additional NISO events you would like to view that do not appear in the list below, please contact Shaun Akhtar with your request. Archived recordings will be added to the Library's Webinars List wiki page. All live screenings take place in the Baker 11 conference room. "How to Support Direct Access to Increasingly Granular Chunks of Content in Response to User Expectations"
"Experimenting with BIBFRAME: Reports from Early Adopters"
[Virtual Conference] "Expanding the Assessment Toolbox: Blending the Old and New Assessment Practices"
April 29, 11 a.m.-5 p.m.
"Software Digitization and Preservation: If I Have the Files, How Will I Run Them?" [Virtual Conference] "The Eternal To-Do List: Making E-books Work in Libraries"
[Virtual Conference] "Evolving Scholarly Communication Models"
September 23, 11 a.m.-5 p.m.
[Virtual Conference] "Interacting with Content: Improving the User Experience"
October 28, 11 a.m.-5 p.m.
[Virtual Conference] "The Semantic Web: What's New and Cool"
Dartmouth College Library is a Library Standards Alliance member of the National Information Standards Organization (NISO). Library staff members can view live or archived versions of a number of NISO events throughout the year. These events include webinars, virtual conferences, and open teleconferences. posting links for the archived versions on the Libopen Wiki "Webinars List" page. The archived events can be viewed by any library staff member at any time during the year. Shaun Akhtar is the primary contact for these events. Cecilia Tittemore is the secondary contact. announcements of webinars and other professional development opportunities. Shaun Akhtar and Cecilia Tittemore are co-editors. Please send ideas for the blog to them.